Saxophone player Jimmy Beckley began his musical career in the 1970s as a clarinetist in bands with his guitarist brother, Robert Beckley. Between 1983-87 Jimmy ran his Jazz Club in Tesano and out of this came his Jazz and Highlife Combo. In 1989 the Combo released the ‘Twilight of the Volta’ album. Many top artists have played and jammed with Jimmy and his Combo including local jazz singers, Rama Brew and Avalon, traditional artists Captain Yaba and Atongo Simba, highlife musicians, Nat Buckle and Anthony Scorpion, and the famous Cameroonian sax player, Manu Dibango. music to local and international fans. Takashi is also an NGO that doubles as an African research center and music consultancy. The City Boys is a highlife guitar band formed in the 1970s that combines highlife music and concert party, or a local popular theatrical group that stages vernacular comic plays and highlife operas. Concert parties were initially imitations of American vaudeville and British music hall, complete with blackface minstrels, ragtime music and tap-dancing, all the rage with urban Ghanaian elites around 1900.
and Lucky Dube, emerged on the scene. Singer/guitarist Ellis “Salaam” was born in Accra in 1955 and got his ftrst musical training in Ga cultural groups like Cultural Voodoo and Sammy Brown’s Agbafoi, which combined traditional Ga instruments with West African finger-picking guitar. Salaam then moved on to play withE.T. Mensah’s famous Tempos highlife dance band and other dance bands such as The Barristers and El Beats. In 1980 he formed the Cultural Imani acoustic group that consisted of guitar, gome bass drum and percussion. In August 1981 the band recorded at Bokoor Studio and some of the songs were released on the’ Guitar and Gun’ compilation highlife album by Cherry Red Records of the UK (re-released on CD in 2003 by Stems African Records of London). In the 1990s Salaam teamed up with his manager, Kobena Andah, and expanded the Cultural Imani band to include bass guitar and horns. In 1992 the group recorded the ‘Djenba’ (the Ga word for character) at the Accra studio of Nana Danso (Director of the Pan African Orchestra), which was fmanced by the German Development Agency. Salaam’s group is currently working on its second release entitled ‘Weku Shia’ (Family House). the youth to progress and to forget foreign music and do their own thing”. which provide a deep percussive “bass-line”. Wulomei plays old Ga and Liberian sea shanties, gome songs, and the kolomashie and kpanlogo recreational songs of Accra and Akan highlifes. To portray the band’s indigenous orientation, Wulomei’s performers wear the white or yellow cloth and frilly hats of the Wulomei or traditional priests and priestesses of the Ga people of Accra. In 1974 Wulomei released its debut record, ‘Walatu Walasa’ followed by, Wulomei in Drum Conference’ released on the Phonogram label. During the 1970s and 80s, Wulomei made a number of successful tours to Europe and the United States. Following Wulomei’s initial success, there was a proliferation of so-called “Ga cultural groups” such as Blemabii, Dzadzeloi, Abladei, Agbafoi, and Ashiedu Keteke. Two members of Wulomei also created their own groups. 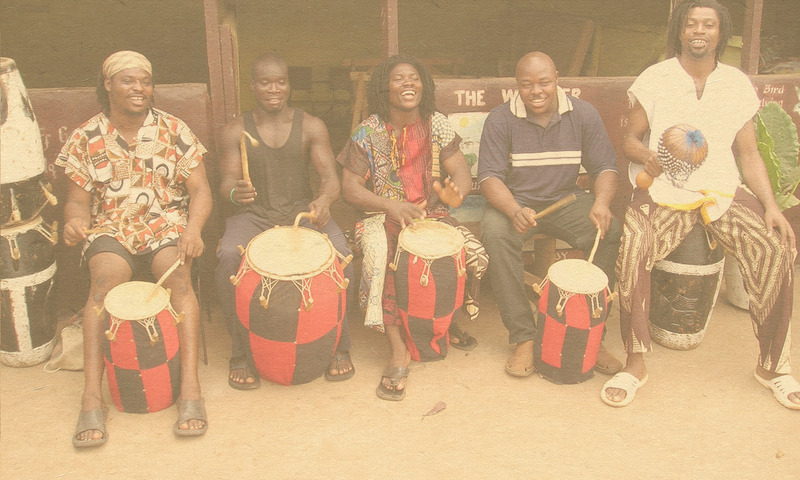 Wulomei’s gome drum player, ‘Big Boy’ Nii Adu, formed theBukom Ensemble and Wulomei’s lead female singer,NaaAmanua, formed the SukuTroupe. Nii Ashitey has retired and the second generation Wulomei is run by his son, Nii Tei Ashitey, and daughter, Naa Asheley. and the USA, and has toured all over the world. Mac Tontoh began his career in th 1950s with the Broadway Dance Band and Teddy Osei ‘s highlife band, The Comets. After Teddy decided to go to London in 1962, Mac joined the Uhuru (Swahili for Freedom) highlife big band. In 1969 Mac joined Teddy’s London-based group, Cat’s Paw. Itwas out of this group that Osibisa was created in 1969. The name is derived from the old Fanti name for highlife – osibisaaba. Osibisa released its first single record in 1970 – ‘Music for Gong-Gong’, followed by a string of hit singles and albums like’ Osibisa’, ‘Heads’, ‘Happy Children’, ‘Welcome’, and ‘Black Magic Night’. Many of Osibisa’s singles such as ‘Sunshine Day’, ‘Dance the Body Music’ and ‘The Coffee Song’ made it into the British Top Ten. The band included West Indian, Nigerian and Ghanaian musicians such as Kiki Gyan, Koji Ayivor, Emmanuel Rentzos and Potato. Besides trumpet for Osibisa, Mac Tontoh also played flugelhorn, traditional percussion and the Lobi xylophone that he learned from musicians who had settled in his village in Ashanti. In the 1990s Mac Tontoh returned to Ghana, where he became an executive member ofMUSIGA, and in 2001, a Commissioner with the National Commission on Culture. He currently manages and plays trumpetlflugelhorn in a band called Osibisa Kete, which includes a huge battery of local percussion. They have performed internationally and were featured at a recent Edinburgh Festival. Mac is also carrying out the ‘Mac and His Kids Project’ to teach African music in schools. with funeral appellations, pa1rnwine drinking, and philosophical/moral commentary. However, from the 1930s popularity ofthe instrument began to die out so Professor Nketia and Koo Nimo arranged for it to be taught by Osei Koranyke at the University of Ghana, beginning in 1990. Osei is from the western part of Ashanti and was taught the six-stringed seprewa harp-lute by his grandfather when he was eight years old. He is now reviving interest in the instrument. touch of jazz and Brazilian bossanova. He and his Adadam Agoranuna group have made many recordings and international tours. Koo Nimo was born in 1934 in Fuase near Kumasi, and his musical career began with a highlife band at his Cape Coast school of Adisadel College. He then left for the Medical Research Institute in Accra to study laboratory work. When he graduated in 1955, he returned to Kumasi and teamed up with guitarist Fred Akuffo to form the Antobre group and did his first recordings with the concert band of I. E. Mason. Charlie Christian and Jack Duarte. He was also influenced by the jazz music of Django Reinhardt; Wes Montgomery, Jim Hall, Dizzy Gillespie, Thelonius Monk and Miles Davis. Koo Nimo has been on the Executive Committee ofMUSIGA, an advisor to the Ghana Broadcasting Corporation and a member of the Ghana National Folklore Board of Trustees. He taught in the United States for several years at the Universities ofSeattle and Michigan. In the mid 1990s he was awarded an honorary doctorate by KNUST, where he is now teaching at its new Cultural Studies Unit.